Come sail the high seas with the Caravan Stage Company’s traveling “Nomadic Tempest” production. 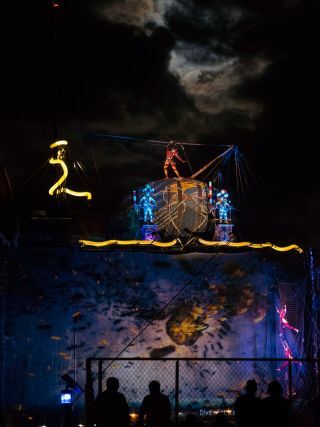 The show—an original experimental opera with aerial dance, large puppets, and video projection—is performed on the deck and rigging of the 90-foot Amara Zee ship. The tall ship is the stage for the show, and, thus, the performers, audience, and audiovisual equipment are outdoors. The production, which focuses on the theme of climate change, highlights the journey of four monarch butterflies displaced from their homes; projected content includes sky-river images simulating the flight paths of the butterflies gliding over the Earth. All video graphics, animations, and images are originally designed and displayed in a continuous panorama by a Barco HDX-W20 projector. The images, a mix of pre-rendered video, live-generated and manipulated CGI, are front-projected on an 80-inch-wide, semi-transparent scrim at the front of the ship, which allows the company to “have imagery appear to float in front of the stage and performers behind,” according to Will Young, video artist for Caravan Stage Company. While sailing the open seas, the ship’s audiovisual equipment is open to dust, sand, and saltwater. The production company safeguarded it from these natural elements by installing a Tempest Cyclone 8000 enclosure. The Cyclone enclosure is constructed from heavy-gauge aluminum and stainless steel, and feature Tempest’s Goldilocks Operating System; Goldilocks is designed to track temperature and humidity 24/7/365 to protect internal elements, like the Barco projector.